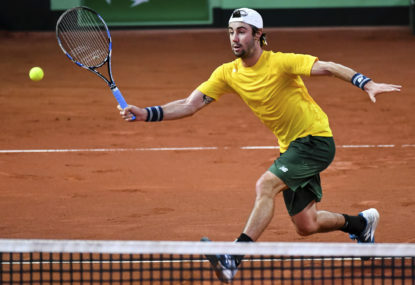 The Davis Cup, a tournament steeped in 118 years of tradition, is now officially the Little River Band of world sport. It exists in name only. We have a tendency when compiling ‘best ever’ teams to default to overall records. 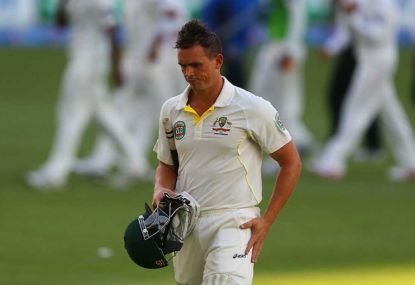 You’re three schooners in, and off the top of your head, you come to the names Cook, Anderson, Pietersen and Ponting. Is T20 the purest form of cricket? For a brief moment, we faced the nightmare of a summer without a ball being bowled, such was the acrimony in the cricket pay dispute. 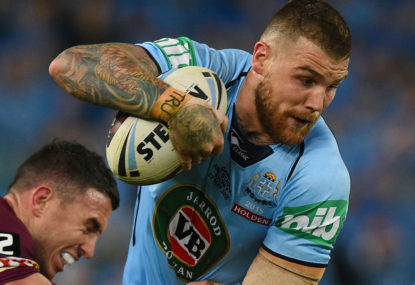 Who makes up NSW's greatest 'one Origin wonder' side? Be it humility or platitude, the professional sportsman is prone to stating they’re happy to have simply played one game in the top grade. In last year’s Round 22 clash between the Raiders and the Tigers, I was completely enamoured with James Tedesco. Are two Tests better than one? The term ‘one-Test wonder’ has become a pejorative expression. With connotations of luck and a whiff of a hoax, it’s a name unbecoming of those who have reached the pinnacle of cricket. There’s nothing sexier than a rift, especially when it’s between members of an ostensibly happy family. As the travails of Australian cricket play out like an episode of The Real Housewives of Melbourne, those of us on the sideline are wont to donate our two cents worth. We Sydneysiders are an arrogant lot. The ‘yeah but we have the harbour’ attitude sees us claim to have the best city in the world. Tigers legend Stephen ‘Blocker’ Roach once remarked he’d only ever seen the hill at Leichhardt stand for three players whenever they touched the ball – Larry Corowa, Ellery Hanley and Benji Marshall. Scanning The Roar’s cricket comments is a riveting pastime. A symposium of passion, some points are well made, some less so. Some posts push the barrow of certain players, often curiously. 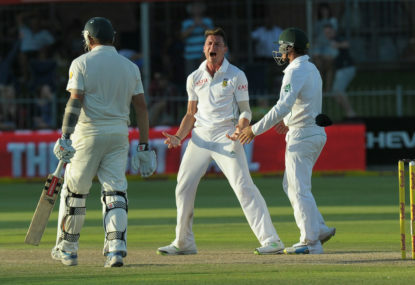 In the second Test against South Africa in Port Elizabeth, the Aussies were bested by their own hubris as much as the gorgeous reverse swing of Dale Steyn. It’s important to clarify that Brett Stewart wasn’t suspended because of the sexual assault charge, but rather for being drunk at the NRL season launch, at which he was the face of the game. 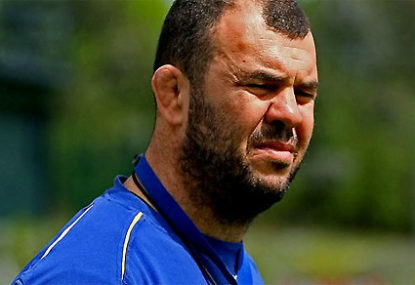 JDB has to be stood down, and I’m a Dragons fan. His actions, which have yielded the most serious of charges, have clearly brought the game into disrepute. The Tigers favouritism may arrest that slide, Dane. Just like the Dragons, they don’t cope well with expectation. Yes, but this has happened countless times before and the umpire doesn’t conduct a straw poll of the fielding side to determine whether a ball is still in play. As such, perhaps there’s enough grey area to make such a determination despite the appeal. If, instead of asking the keeper “did you ask him to throw the ball to you?” he asked, “did you consider the ball to be in play, given it had come to a stop and the player was not attempting a run?”, would the player have answered differently? Only he knows. Either way, they’re leading questions. Look, you’re probably right and I’m most likely wrong, but it just frustrates me Spruce. We can’t all have Bellamy (although we got close at one stage). With anyone, be it player or coach, you look for improvement. Yes we missed the eight in 2017, but relative to expectation, it was a good year. That we ended up with the third best for and against after such an insipid 2016 is encouraging, but given the acquisition of a Hunt and Graham, another finals miss should spell the end of Mary’s time at the Dragons. Is Paul McGregor the right man to coach the Dragons? Common sense should have prevailed, Brett. Given the ball had come to a stop, the umpire should have regarded it as not in play (hence, dead). Instead, he asked Emmanuel Stewart “did you ask him to throw the ball to you?” I’m not comfortable with this kind of prompting. Mind you, that was a consequence of the initial appeal. 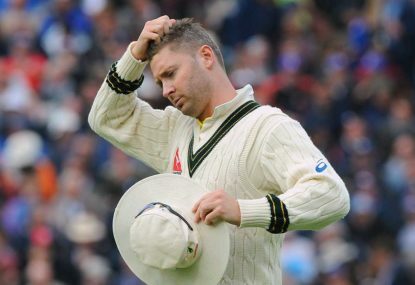 That the captain said on reflection he would have withdrawn the appeal is an empty gesture. His last two seasons have yielded six hundred odd runs each. Good, but a far cry from the thousand run seasons required in previous eras to earn a test cap. His talent is identified but I’m not convinced he’s banging the door down. If we’re going to pick players on potential and a modicum of form, then you need to persist, or you just perpetuate that cycle of failure. By that measure, Cartwright and Maxwell are ahead of him in the pecking order. 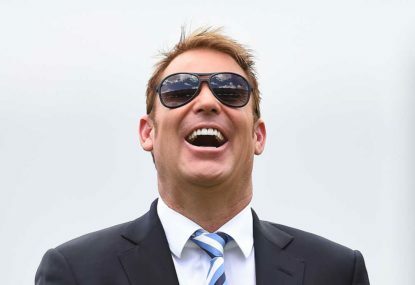 Lehmann won’t be picked. He’s cavalier but I’d like to see a full season of runs. If it wasn’t for the boycotted tour of Bangladesh in 2015, Bancroft most probably would’ve worn the baggy green. He is first and foremost an opener. I’d be disinclined to pick him as a keeper, considering he wouldn’t be his state’s first choice of Whiteman was fit. Has ability, but would like to see a bit more. I can’t understand why people are so spellbound by Shaun Marsh. We need to look past the aesthetic. He’s been dropped at least four times. He’s demonstrated that he has no consistency over a series. Renshaw won’t be dropped. He plays the long game, which is what the selectors did when they selected him. He came under criticism for getting bogged down in Adelaide, and was praised for improving that aspect of his game after a couple of tests. To be fair, not one team notched 200 in the most recent Shield game, and not once did the run rate get above 3 per over. 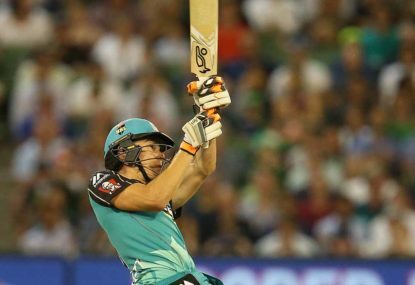 Does Matt Renshaw need to be dropped for Brisbane? 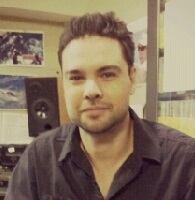 Josh Inglis is a talent too. What would an Australian wicketkeepers XI look like? A lot of players had one or two good series averaging over 50 (i.e. Cook, Clarke, Bell, Pietersen, Hussey), but haven’t sustained top form over the course of five series. When records are similar, I tend to go with combinations. Aggression and accumulation. 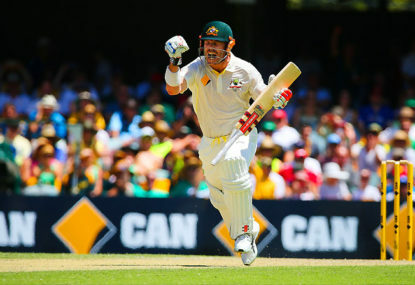 Warner’s strike rate in Ashes cricket is 72. I’m not talking horses for courses. More a general point about incumbency. While Khawaja appears to have been pigeonholed as a hard deck specialist, both Maxwell and Cartwright have shown form on home wickets. In that case, I suspect Maxwell, slightly more entrenched in the side, may win out for the first test at least. But it’s anyone’s guess. You’re right Ryan. Was thinking back to last season. Incumbency, as it traditionally has, should hold some sway. I know that Cartwright is an incumbent, but given Usman is a certainty, it would follow that Hilton, who replaced him, would be the man to go. I think Maxwell deserves first crack. With the first test being a pink ball match, it is unlikely the fifth bowler will be called upon to do much, if anything. Yes Red Kev, but we’re playing this series on Aussie wickets. 240 games, 18 origins, a premiership and about to enter my prime. Yep I’m more than happy to do “what’s best for the team”. Gilchrist’s observation about Nevill is commonly held and commonly stated. Not what I would call mind-blowing. As for Woakes, I don’t mind a few verbal barbs. It adds to the build-up. Having said that, as a bloke who took 1/96 in his only test against Australia (at 4 an over), perhaps he should focus on being better. I mean he’s not exactly Glenn McGrath now is he?! We’re all armchair critics when it comes to the commentary box. Is it perfect? Certainly not, but refinement rather than overhaul is the solution. From what I can glean, each commentator has fans and critics in equal measure. What does that tell you? All of them have insight. Mark Nicholas is a wonderful student of the game. I concur that less fluff is required and the Benaud rule of ‘less is more’ should apply more stringently. But all in all, the coverage is pretty good. Everyone should lighten up. My inclination is to pick Maxwell at 6 and allow him a crack on Australian wickets. The next couple of Shield games will paint a picture. A half century might maintain the selector’s faith. Moises is a great St.George boy. More like 1300FROWNS Stadium for you Matt?! Test cricket has shown remarkable resilience to have survived for 140 years.It most certainly has a future, but it requires players and administrators to be on the same page. No conflict in scheduling. Pay test players what they’re worth. The game cannot afford to cannibalise itself. The players in particular must do more to promote and preserve the sanctity of the from they claim they hold so dear.